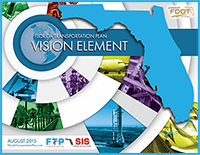 The FTP Vision Element provides a longer-term view of major trends, uncertainties, opportunities, and desired outcomes shaping the future of Florida’s transportation system during the next 50 years. The FTP Policy Element defines goals, objectives, and strategies for Florida’s transportation future over the next 25 years. 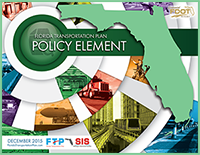 The Policy Element is the core of the Florida Transportation Plan and provides guidance to state, regional, and local transportation partners in making transportation decisions. The FTP Implementation Element defines the roles of state, regional, and local transportation partners in implementing the Florida Transportation Plan, including specific short- and medium-term actions and performance measures. The FTP Implementation Element was developed as a web-based application and will be continually updated to include the most recent trends and conditions as well as FDOT and partner activities. The Implementation Element is intended to be used by FDOT staff, Florida’s transportation partners, and the public to follow implementation activities and monitor progress toward meeting performance measures. The Strategic Intermodal System (SIS) is Florida’s high priority network of transportation facilities important to the state's economy and mobility. The SIS Policy Plan identifies how to prioritize transportation capacity investments on the state's highest priority transportation facilities. The SIS is a primary focus for implementing the FTP. The Strategic Highway Safety Plan (SHSP) was developed as a part of the FTP Implementation Element to address highway safety and aligns with the FTP Vision Element and FTP Policy Element. The SHSP is a statewide, data-driven safety plan for all of Florida’s road users. The plan is the state’s five-year comprehensive roadway safety plan for achieving Florida’s vision of zero traffic-related fatalities. The SHSP includes 13 Emphasis Areas that guide Florida’s safety efforts.